So many of your controls have a "swipe" interaction that can be defined on them using the "Add Interaction" window, yet when I run the screen, I can't figure out how to swipe. The mouse does nothing. I've tried all combinations of the mouse and keyboard that I can think of, and nothing. I'm on a windows PC. Does swipe only work on a Mac? Well, swipe is an interaction that can't be perfectly mapped to a mouse, since it's designed mostly for touch, but it should work without much problems. For, say, a swipe left interaction, you need to do a quick drag over the element to the left. The drag should be quick enough, that means, if you click on the element, drag to the left and release the left mouse button 5 seconds later, it won't work. It should just be one swift drag to the left. The key is that the mouse moves to the left before you release the left mouse button, and that there's not a lot of time between when you start holding and release the mouse button. It sounds a bit complicated, but it shouldn't be, if you keep having issues let us know, and we'll see if we can see if there's another kind of problem, or if we need to tweak this interaction a bit more to make it more accesible from the mouse. Also, make sure the size of the element is not too small. You should be able to do it on a default sized button, and it easier as the control gets larger, but it's very hard to do on a 32x32 icon. Read this and tried to follow the drag guidance...having the same issue implementing a swipe interaction. 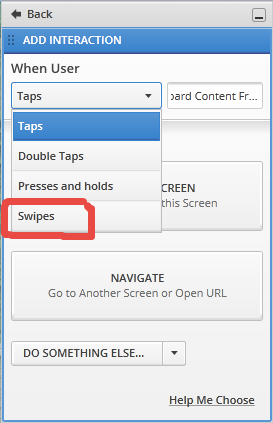 I am using a recent Macbook touchpad and have tried everything to simulate the swipe gesture. Clicking and dragging left does nothing, two finger swipe nothing. Any advise? Is there a keyboard shortcut to trigger the swipe action? Have you tried it on a touch device? Does it work on this prototype: launch money app. The COFFEE entry has a swipe interaction. I tried it on a mac touchpad, and it's a bit challenging. It's a quick click+drag, but your finger needs to be off the mouse button before the drag finishes. I have found it easier to do using a physical mouse as opposed to the touch pad. Unfortunately, we currently don't have any shortcuts for this. But we'll investigate. Yes, works on the device. Thanks! Too difficult to simulate on a touchpad.